Here at Planet Express, we're always looking for fresh recruits to join our spaceship crew. Whether your permanent career assignment is in intergalactic navigation or accounting and administration, chances are, we have a slot open for you right now. Career deserter? No problem! As part of our ongoing effort to give back through recycling, we've salvaged the career chips from some of our past, brave crewmembers and now can pass those savings on to you! What will you be doing when you work for Planet Express? Well, you'll get to see the entire universe and also transport cargo! And when we say entire universe, we mean it. We go places other delivery companies (not to name names -- Mom's Friendly Delivery Company) only dream of going. (Why they were screaming and running while dreaming, we're not sure. It's probably something in the water.) In addition to the fun work environment, some of our benefits include on-board medical facilities with highly trained staff (unless that's the crewmember you're replacing... in which case, welcome aboard! ), a pension plan, stock options, not having a uniform that involves kneesocks, or, indeed, any socks at all if you so wish, and an endless supply of free darkmatter. Even if you can't join our ranks today, you can take home one of two official "Planet Express" t-shirt designs. Both feature our logo, one in grey on a black, 100% cotton t-shirt, one in red and yellow on a heather grey, 90% cotton t-shirt. 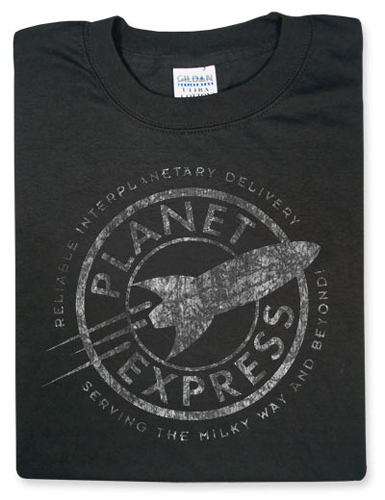 Has the words, "Reliable Interplanetary Delivery. Serving the Milky Way and Beyond!" Note that the printing is slightly distressed (you can see the shirt in several places), much like our employees! This shirt is slightly more fitted than our standard men's sizes.